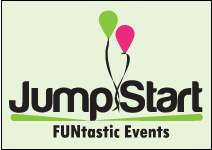 Get some one-on-one time with your child while enjoying the toys, games and fun activities of Jump Start Gymnastics! Bring some friends and enjoy an hour of fun! This unstructured event offers parents, grandparents or even babysitters the opportunity to experience our gym in a fun and safe way and allow the kids to burn off some of that extra energy! Jungle Jamboree is for children 5 and under and their adult buddies. The cost is just $5 a child! All participating children must be signed in at the front desk by an adult before entering the gym. Jungle Jamboree is held on select Fridays from 11:30-12:30pm. Check out the calendar below for available dates! Come join our Ninja Zone staff for a night of action filled fun! Students will begin with a structured group stretch before being released in the gym to supervised open gym time. Staff will be on hand to assist the students with ninja obstacles or some extra training for upcoming missions. In the middle of the event students will split into teams and begin the nerf wars! Students should bring their own guns but bullets and eye protenction will be provided. There will be time to build forts and maneuver around the gym while working on agility and accuracy. Ninja Nerf Night is for children ages 4-13 years old. The cost is just $10 a child! Bring a friend! You don't have to be a student at Jump Start to attend! All participating children must be signed in at the front desk by an adult before entering the gym. Ninja Nerf Night is held on select Fridays from 6:00-8:00pm. Check out the calendar below for available dates! Super Saturday Night is 2 hours of unstructured gym time when children can play and master their gymnastics skills in a safe, fun and friendly environment. Jump Start staff members will be on hand to supervise and assist the students as they choose the equipment and skills they want to practice. Open Gymnastics begins with a short and fun warm-up and ends with fun games and activities. All children ages 4 to 15 are welcome to attend! Bring a friend! Super Saturday Nights are for children ages 4-15 years old. The cost is just $10 a child! Super Saturday Nights are held on select Saturdays from 6:00-8:00pm. Check out the calendar below for available dates! No School? Come spend the day with Jump Start and let the kids have some indoor play time! There will be open gymnastics time available for all ages! School's Out! is held on select Mondays throughout the school year. Check out the calendar below for available dates!